The fabrication of diffractive elements in ophthalmic polymers to induce refractive index changes which may be applied for refractive correction is of great interest in the fields of Optics and Ophthalmology. In this work, polyhydroxyethyl- methacrylate and silicone hydrogel polymers used as soft contact lenses were structured with linear periodic patterns by means of Direct Laser Interference Patterning (DLIP). 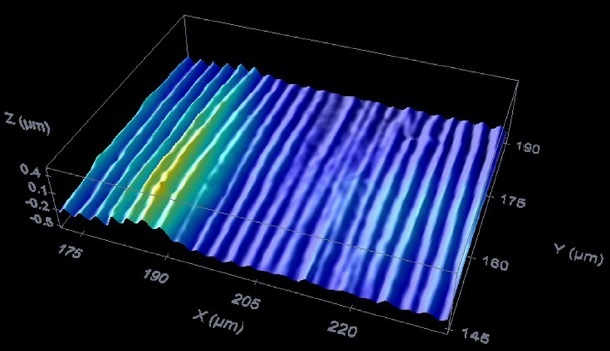 As the laser source, a Q-switched laser system emitting 10 ns pulses at a wavelength of 266 nm was used to generate the periodic modulation on the surface of the polymer materials. The experiments were carried out employing a two beam interference setup, studying the features of the laser processed areas as a function of both the laser fluence and the interference period. The topography of the structured areas was investigated using optical confocal microscopy. Compositional and structural modifications on the materials were studied by means of micro-Raman spectroscopy, scanning electron microscopy (SEM) and energy dispersive X-ray spectroscopy (EDX). Finally, periodic patterns were characterized through diffractive techniques under illumination of a continuous-wave 632.8 nm He-Ne laser to determine the diffractive properties of the DLIP periodic patterns and the refractive index change induced by the laser processing.